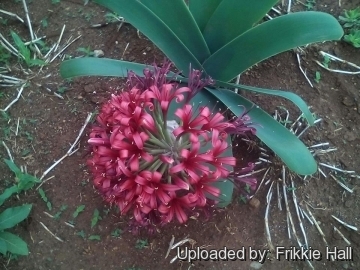 Origin and Habitat: South Africa (Eastern Cape, Free State, Gauteng, KwaZulu-Natal, Limpopo, Mpumalanga, Northern Cape, North West, Western Cape). It extends into Zimbabwe through to Kenya in east Africa. Altitude range: This species grows at altitudes between 700 and 1500 metres. Habitat and ecology. Ammocharis coranica is a perennial bulb that grows in the summer rainfall area. It grows in open, mainly on plains, often near pans or in depressions which are seasonally wet, but in a variety of biomes, such as desert, grassland and Karoo. Its habitat is characterised by lengthy dry periods and severe droughts. Dense stands of Ammocharis coranica plants, interspaced with Salsola shrubs, grow on the compact clay soils. Ammocharis coranica, is relatively frequent and often forms massed displays. The foliage and flowers are poisonous, but they are unpalatable and are seldom eaten by livestock. After flowering, large numbers of fleshy seeds are produced in membranous capsules which eventually split when the seeds mature, depositing then around the plant. The fleshy seeds germinates spontaneously, producing a radicle (small root) and ultimately a small leaf. If the seed comes to rest in a favourable situation, the radicle will take root and the young plant will develop. Failing this, the seed and embryonic plant will desiccate and die. However seeds are very tough and can survive for a long time, sometimes months, in harsh conditions before they die. 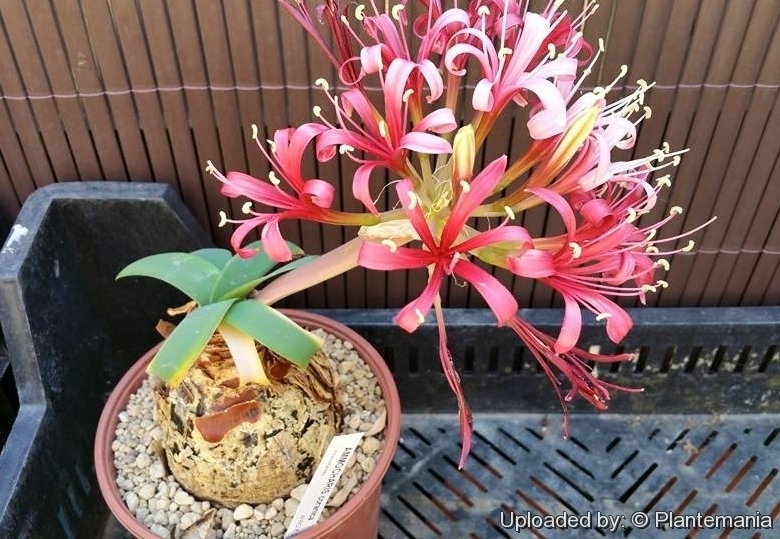 Description: Ammocharis coranica, known as the Karoo Lily, is a larger bulbous herbs with the bulbs being relatively large and thickly brown- tunicated. This large lily is recognised by its profusion of beautiful deep pink, sweetly-scented flowers. The spectacular flower head is arranged in a rounded terminal cluster. The leaves are flat and broad, from the base of the plant and lying along the ground. It is a characteristic feature of Ammocharis that the dry inflorescence breaks away from the bulb and rolls along the veld in a light breeze, distributing its seeds as it moves, hence the common name tumbleweed. It shares this characteristic with the genera Brunsvigia and Boophane. Derivation of specific name: coranica means “to do with korana Bushmen” in Latin. Bulb: Ovoid, reaching a diameter of 15-22 cm, not produced into a neck. Tunics very numerous, brown, membranous. Leaves: In spreading fan (arranged in a parallel fashion), lying along the ground sickle-shaped or straplike, reaching a length of 30-60 cm, 2,5 cm broad, green, glabrous, blunt, produced before or after flowering and not persistent, the plant goes dormant in dry spells and in winter. The tip of the old leaves is truncated, marked by the point where the plant goes dormant in the previous year. Inflorescence: Peduncle stout, lateral, 15-30 cm long. Flowers 20-40 in an umbel (flower cluster). Pedicels 25-30 mm long. Spathe-valves large, ovate. The whole dry inflorescence finally breaks loose and is blown over the veld, discarding its large fleshy seeds as it goes. 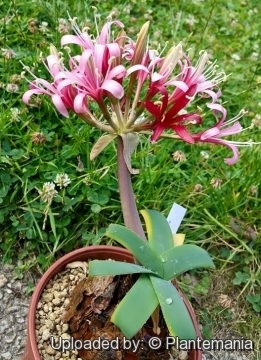 Flowers: Attractive, tubular, nerine-like, 50-70 mm long, deep pink to bright red, fragrant. Perianth-tube 12 mm long. Segments 3-5 cm long. The stamens ± as long as the tepals. Blooming season: Flowering can be any time from spring to mid-summer, and is opportunistic in the sense that it can be triggered by good rains or fire – under these conditions flowering is spectacular. Populations do not necessarily flower every year, despite favourable conditions. Fruits: Membranous capsules which eventually split when the seeds mature. 1) Vlok, J. and Schutte-Vlok, A.L. 2010. “Plants of the Klein Karoo”. Umdaus Press, Hatfield. Traditional uses: In Lesotho, a gluey paste made from cooked Ammocharis bulbs is used to mend cracks in clay pots. In Namibia parts of the bulb are used to dress wounds and boils. The diluted juice of the roots is used as a spray by some tribes to ward off evil spirits from their huts.